There is something exciting afoot. Or, more accurately, at hand. You may recall a former post in which I outlined the two most disappointing things that I am unable to do as a one-armed girl. One of those two was putting a ponytail in my hair. Shortly after the post was published, I got an email from my good college buddy Mike, who is now a professor of engineering at a college in the northwest. He asked if I would mind some of his students working on a solution to my ponytail dilemma. Mike previously spent a considerable amount of time studying something to do with engineering and rocket science––at least that's what I remember. I'm sure he will be disappointed at how much I was not paying attention when he was explaining it to me; it's just that most of the time when Mike tried to explain something to me, it sounded like "blah blah... engineering... blah blah blah." I was an English major––if he had explained it in terms of relational or plot development, we might have been on the same page. All I know is that I saw a picture of him floating weightless in an airplane. So, I felt pretty special when he emailed. 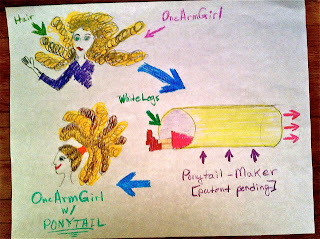 I mean, to think that helping a one-armed girl get a ponytail in her hair is a priority right up there with advances in rocket science. Take that, NASA. Maybe if you had put more money into something practical...I mean, how many people need to get to the moon and how many people need ponytails. It's not rocket science, people. I, of course, gave my full permission to Mike's proposition, but then heard nothing more about it until this week, when one of his students emailed to say that he was on a team working on (what I choose to call) Project Ponytail. This very professional sounding young man requested that I elaborate on the issue I am having; that being, putting a ponytail in my hair with one hand. So, in my best engineer-ese I explained the necessary requirements. I may have used words like "functionality" and "demographic." Apparently, I can parrot engineer-speak, if I can't understand it. I may have also used the phrase "resistance may be critical"... Thanks, Mike, for the years of exposure, from which I at least gained some skill in imitation. If the team wasn't laughing from the beginning of my email, they certainly were when I suggested "consulting" other people with long hair requiring ponytails. Sometimes I have to shake my head at myself. As I clicked 'Send,' I suddenly had flashbacks to a similar situation. I was having my last prosthetic arm built. Perhaps a bit more complicated than a ponytail-maker, but the custom design for the shoulder of the arm, specifically, took hours and days of fittings and adjustments. The resulting leather patch with a hole that rested atop my tiny shoulder was functional, and an amazing testament to the patience and persistence of my prosthetist. But it was a tiring and frustrating process nonetheless. Now I was imagining months of Skype consultations with seven engineers on my monitor, scrutinizing my scrunchy. If you don't know what a scrunchy is, good for you. And you obviously were not around for the '90s. But I was immediately afraid that the task set before these poor youngsters was close to impossible. My prosthetic arm, which cost close to the price of a new car, is now living in the back of the closet with clothes I haven't even seen for years. I suddenly thought of my helpful engineers, willing to take up my cause, as unsuspecting victims of the sort of physics dilemma that would make Einstein's head spin. These students probably picked my project because they thought it would be easy. I mean, it's just a ponytail, right? Oh the naïveté! Little do they know Project Ponytail is going to make building wells in northwestern Africa look like a piece of cake. 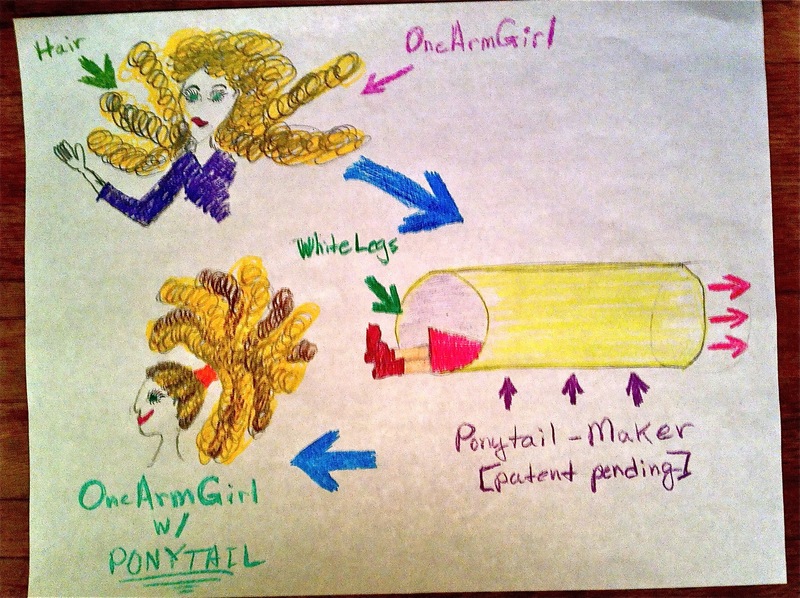 But I received another email today, so it seems Project Ponytail goes forth. And now, I have to email all the hair gadgets I've tried over the years that ended up at the back of my closet with the fake arm. Maybe these guys (or girls) are less naive than I had feared. I hope I can be of some help. ha ha ha ha!!! Let's meet...I will show exactly how a one armed girl can do a ponytail. I have been doing it since age 19. ;o) It DOES in fact take practice to make perfect.